Graph processing is a hot topic right now – especially since it enabled investigative journalists to uncover the world’s biggest offshore banking scandal. Commonly referred to as the “Panama Papers”, graph processing allowed investigators to sift through a 2.6 terabyte morass of data incorporating 1,400 offshore tax havens and 100,000 companies in order to reveal hitherto unknown connections. Did you know that SAP HANA includes a native in-memory graph processing capability? With nearly two hours of hands-on video content, the new SAP HANA Academy playlist covering SAP HANA graph data processing provides tutorials that cover everything from a chalkboard overview and introduction, to downloading, installing, and working with the graph viewer tool, to enabling graph processing inside calculation views via the graphical modeler based on XS Advanced and SAP Web IDE for SAP HANA. All feedback welcome – in the comments section below, @pmugglestone or mailto:HanaAcademy@sap.com. is there a possibility to work on Graph model on SPS10 ? As per SAP , it is generally available from SPS10. I had only activated the parameter graph_engine in our system which is on SPS10. Graph processing was formally released as GA in SPS12. Anything prior to that was just a preview. I tried the example given in the graph reference guide in both SAP HCP trial(1.00.122.04) and our on-premise HANA system(1.00.122.04). 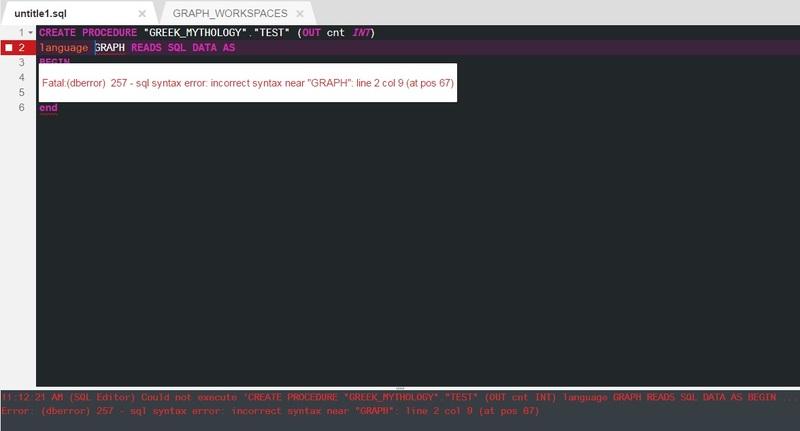 SAP DBTech JDBC: : sql syntax error: incorrect syntax near “GRAPH”: line 2 col 10 (at pos 97). Can you please help me understand what the problem might be? It’s difficult to say without seeing the code, but graph script syntax changed between HANA 1.0 SPS12 and HANA 2.0 SPS00. Your systems look to be SPS12 but the code from the reference guide may well be for HANA 2.0? Unfortunately the very first video in this series mentions SPS12 and I thought it would work in my system. SAP HANA graph needs SAP HANA enterprise or platform edition?